I was asked to speak at the Society of Editors regional conference 2014 a while ago, and so on Monday I found myself talking to a room of people about coding, social media, and data journalism, among other things. It was a little distracting when the Duke of York loomed in the doorway towards the end of my talk – he was speaking about journalism and apprenticeships – but on the whole I got through without being boo-ed or having pastries thrown at me. There were enough discussion points from the day to make several blog posts (particularly around this panel discussion), and I intend to come back to those when I have more time, but in the meantime I thought I’d pop the draft of what I talked about (sans slides, which were purely illustrative) on the blog. Titled Innovation and Digital Skills in Journalism, the talk was an expanded version of what I covered in my 5 minute slot at News:Rewired last February. So if this is TL:DR you should have a look at this instead. When I was 18, the editor of the Tenby Observer suffered an unaccountable rush of blood to the head, and agreed I could to spend a year in his newsroom, working as a junior reporter. He even paid me £30 a week and in return I supplied him with a headaches, calamities, the occasional story and, often, a weekly ‘correction’ roundup, amending whatever I’d written the previous week. 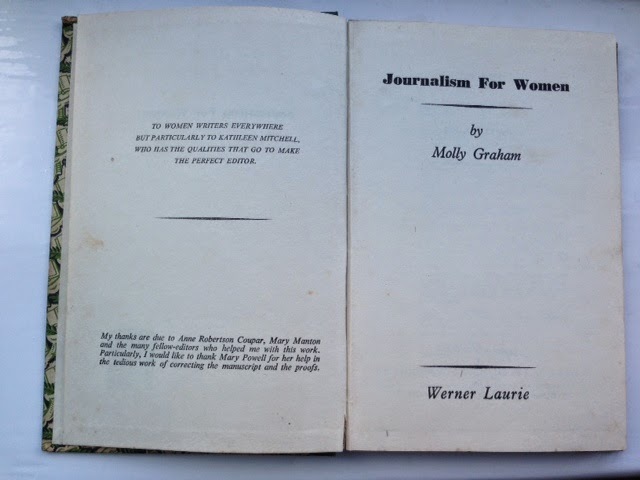 To celebrate my admission into the world of journalism, a friend presented me with a copy of the 1949 classic Journalism For Women, which imparts the following advice to an editor: “Maids respect a mistress who can do any of the tasks she expects of them”. I’m going to use the term ‘journalist’ but most of what I say applies to everyone in a newsroom, including editors. So, as I’ve been asked to talk about the emerging skills and opportunities in newsrooms, I think we should move forward with that phrase ringing in our ears. Companies must invest time and money in training journalists for their digital roles, but I’d expect journalists to want to explore and master things themselves too. There are few social storytelling tools out there that can’t be learned within a few minutes – from Awesome Screenshot to Zee maps – they aren’t complicated, and they make digital storytelling, sharing information and collaboration much easier and more effective. In March, Trinity Mirror Regionals ran a two-day play and learn event for journalists at UCLan where a group of reporters, photographers, senior newsrooms executives, specialist reporters and newsdesk types got together to try new things. 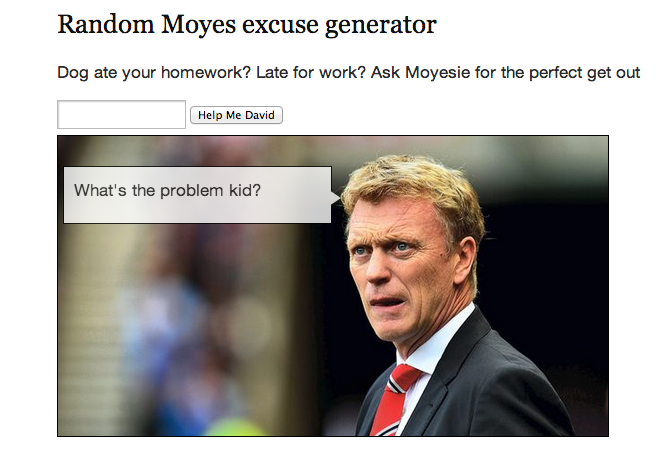 Among the innovations that emerged were timelines, gifs, video soundbites for Explainer Journalism, interactive maps and, through the collaborative efforts of a deputy news editor and a mobile journalist from different titles, the Moyes Random Excuse Generator. They used a site called Codepen and a spreadsheet to create a native design app for the MEN that summed up the spectacular popularity fail of the Man Utd manager. Fun; shareable; drove traffic to other parts of the site including the home page. Journalists should not only use social media but but absolutely familiar and comfortable with the nuances and tones of different sites and tools. What works on Facebook doesn’t mean engagement on Twitter. When and why Instagram instead of Flickr? Live tweet, or live stream? It’s an essential skill for a reporter to have, and for their managers to understand too. Shareable content is the holy grail; if you don’t know your audience – what tone to strike with them, and where, when or how they use social media so you can share your own and your title’s content with them well – you are missing an essential skill of modern journalism. I’d expect any journalist applying for a newsroom job these days should have active Twitter and LinkedIn profiles listed on their CVs, plus links to their multimedia work and, preferably, their updated and engaging blog. These are the social journalism skills they need to do the job effectively and are as important as a decent cuttings portfolio – and for some roles, of considerably more interest. We need bright, engaging, questioning communicators in our newsrooms, who can create networks of geographic and niche communities; it’s no longer enough to competently turn a ring-in from the newsdesk into a splash. This doesn’t mean you have a phone on you – it means your smartphone is an extension of your writing hand. It needs to be packed with apps – such as Audioboo, Vine, Dropbox, Maps, Twitter, Snapseed – and your go-to tool for covering a story, whether it’s the scene of an accident, or a council press bench. Journalists now can capture news more effectively on a phone that we ever could with a notebook and some overwrought adjectives; phones let us create multimedia, edit it and share it without going near a desk – we can crowdsource, create, package and market our work, and do it in real time, allowing more transparency and accessibility to what we do than ever. At a time when regional journalists are still suffering a backlash as a result of some murky national practises, mobile and social journalism can help us a chance to re-establish an eroded trust, through open reporting, accessibility and transparency of information and purpose. A mobile journalist is not someone with a mass of kit, it’s someone who sees a story and transmits it, in real time, via whatever device and medium best suits the purpose. This is one of the most dramatic innovations in our trade of recent years, and the most exciting – the ability to self-publish reports, whether 140 characters or a live streamed video, means removing a filter and a time-lag between newsroom and audience. I guess the old idea of ‘we’re journalists – we don’t do Maths’ was kicked into the long grass some time ago, and in Trinity Mirror the Data Unit, where journalists and coders work together to interrogate raw data and produce information, content packages and interactives of relevance and importance to all titles, is an absolute gift. Certainly, when I was a daily title editor they kept my newsdesk supplied with a constant source of potential splashes and the daily Data Bulletin was a welcome email. But data journalism isn’t the preserve of the expert – taking raw information, interrogating it and creating compelling, valuable content is now a pretty basic requirement. Using free tools like Datawrapr and Tableau lets us not only present a story in an interactive way but get to the heart of what the story really is. Making data shareable adds another layer of engagement and an opportunity for further stories and content. Remember when the MPs expenses logs were made available? What newsroom didn’t gleefully fall on them? Data journalism is more than spreadsheets though; today’s journalistic toolbox needs to contain basic coding skills too. Coding isn’t a dark art and html isn’t someone else’s job – if you make a Twitter widget or to show conversation around an article, for example, or an embeddable map to show the location of a story, being able to hack the rudimentary backend code by adapting it for your site and purpose is important – and empowering. Expecting someone else to sort out your multimedia or html equivalent of the newsdesk rewriting your intro – ie. not something any journalist wants to happen. Know what works. Analytics have completely changed what we know; tools such as Chartbeat and Omniture tell us what our audience is reading, sharing, responding to – and sites such as Hitwise show us where they really are going to find their news. Twitter analytics, Facebook Insights, the plethora of Twitter tools, retweets and favourites, indicate our social reach and engagement. Analytics used to be the preserve of the marketing department – the digital journalist skillset should combine knowledge and application of analytics to get their stories in front of as many eyeballs as possible. Digital audience footprints are easy to follow and they let us build up a detailed picture of our audience, from when they are online, and with what device, to what they share or what they save to read when they have more time. Knowing what your audience wants doesn’t mean we become Upworthy, or the preserve of listicles – it means we reach more people and make ourselves more relevant to their lives. It means we make better products – what we create in digital can inform our print content and make it richer in tone, voice and authenticity. It also means we make money; as more people come to our site, stay on it and share our content we understand more about them and our commercial colleagues can target them more effectively. Liverpool Echo editor Ali Machray says his audience is now as large as it was during the glory print days of 1985. I think that’s something to be very proud of. Innovation and creativity thrive in a digital newsroom where the priorities are audience, then content and, finally, platform, not vice versa. The new digital innovation team being built by Trinity Mirror is about using the skills and the mindset I’ve mentioned here, bringing a passion for journalism together with the expertise and interests of our audience and communities. When I was a reporter I would file my copy and wait to see it in print. Sometimes I’d wait days, if it was a holdable splash. Now reporters own a story; words, video, audio – whatever elements make it sing – publish it, market it and assess how it performed. You get instant feedback (not always a pleasant experience) from your readers and you see a story change and gain new legs as more diverse voices are added to the discussion. It’s making us more relevant. While audience attention span may seem to be dwindling and the value of social sharing is questioned every time Facebook tweaks its algorithm, we know – thanks to some research on the subject – that the links that are most likely to be saved, shared and distributed, are actual news. Not lolcats, not lists, but facts. This is the best time to be a journalist.